Growing up, our neighborhood sentinel stood watch from his front porch, alert and ready to seize upon any passerby. His bark echoed between the houses, and we were dutifully warned by all the adults to give him a wide berth. He was a troubled dog, with a mysterious past. I imagined his face behind the screen door, an angry pairing of daggered teeth, slimy, dripping gnarled lip, and dark, menacing eyes. On our side of the door his swift canine canter would break into a full-speed sprint across the lawn, a black blur with a single glistening highlight at his flapping jowl. In our young minds it became a survival art to navigate to each other’s houses and back without waking the beast. Palms sweaty, on tiptoes, we’d walk in pairs with one suspended breath from the edge of his property to the next, one eye on the door, and one eye on the safety zone. From paper boy terror, to cyclist wounds, the dog’s ferociousness became legendary and walking by his house was no longer an option. Fear’s invisible hand guided us like marionettes; first one house away, then eventually two, and finally, we never walked within three houses of our local, furry vigilante. Our neighborhood boundaries of safety were prescribed, our path and playground dictated by a healthy fear. Practical fear serves us well when it keeps us safe; it is a self-defense mechanism. With that in mind, I listen to my fear, but I try not to be a marionette in its hand. The dog is long gone and I have since left my neighborhood, but my boundaries of safety are always being established, informed by the combination of my experiences. About 8 years ago I sprained my hip lifting a crate of artwork that weighed 220 pounds. I was immobile, and needed help to do even so little as tie my shoe. I was in agony not just from the pain, but because of my dependency on other people. As a “strong, independent woman,” being stripped of my capability, stripped part of my identity, and it was unnerving. After weeks, even months of recovery I operated in a newly defined safety zone. My boundaries included lighter lifting, even baskets of laundry were questionable, and I NEVER approached 220 pounds. The number itself invoked a visceral response, sweaty palms, stilled breath, as if 220 was my new ferocious beast just around the corner, whose bark echoed between the houses. There has been a lot of growth in the last eight years, including learning how to be comfortable relying on other people, welcoming new definitions of my identity, and being more fluid with my ideas about safety, comfort, and risk. Despite the growth and awareness, strength and (a reasonable degree of) independence continue to be a priority for me, as made obvious by my work at Hybrid Fitness. These last few weeks with deadlifts in our workouts, I’ve been staring down the dog of 220. It has been waiting for me around the corner. I’m perfectly comfortable and safe “2 or 3 houses down” in the 190-200 range, working on my form. I can stay here quietly, but honestly, there is something seductive about the deadlift. And for all my convincing of myself that I am fine to steer clear of 220, there is a powerful part of me that wants to tame the beast, to walk right up to it and have it eat out of my hand. 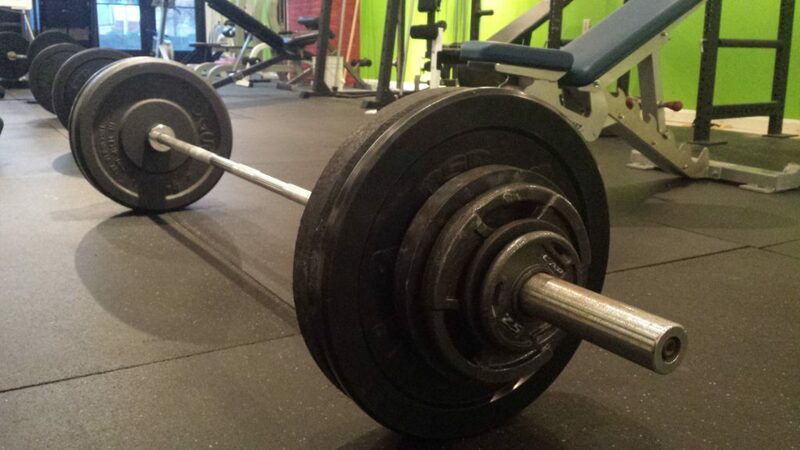 I think a lot of us share a love of the deadlift. It is a movement that is new to many of us since joining Hybrid and at first may have seemed inaccessible or intimidating. But many of us convert after walking up to that bar with those big weights, squeezing our glutes, driving our weight through our heels, popping our hips out and our chests up, and BOOM! We’re deadlifting and going back for more. We use this movement to measure and express our comprehensive strength and power, and we celebrate this success. In strength training, we learn to trust the process of progression. We learn technique; we get better; and we get stronger. While I have been milling around in my safety zone these weeks, I have reinforced my technique and gained strength. This progression led me to my next step. I’m standing in the front yard of 220, its gnarled lip and frothy mouth inches from my own. I know I can choose to go home, but I chalk up and let my body do what it knows how to do. I walk right past my own imaginary boundary and dance my way to 225. Fear is not even in the room, not a single shadow of an echoing bark. In order to progress I had to think about what message my fear was sending. Was I the marionette of fear directed by arbitrary boundaries, or was the fear protecting me from doing something harmful? As soon as I knew I could handle what I was doing, I did it. I made sure there was no ego, no bravado, and it wasn’t about anything other than my own strength in that moment. The arbitrary boundary dissolved as I allowed my knowledge to surface. Listening to fear in a practical sense protects us from certain dangers, while trusting our experience frees ourselves from other types of fear. What are your growling dogs and 220s? Is your fear good self-defense, or is it something to face and move past? Explore the difference, and dance yourself safely to the best version of you!